Large Open Gathering Space, Outbuilding(s), Outdoor Living Space, Shaded Area(s), Sunny Area(s). Garden View, Hills View, Open View, Panoramic. 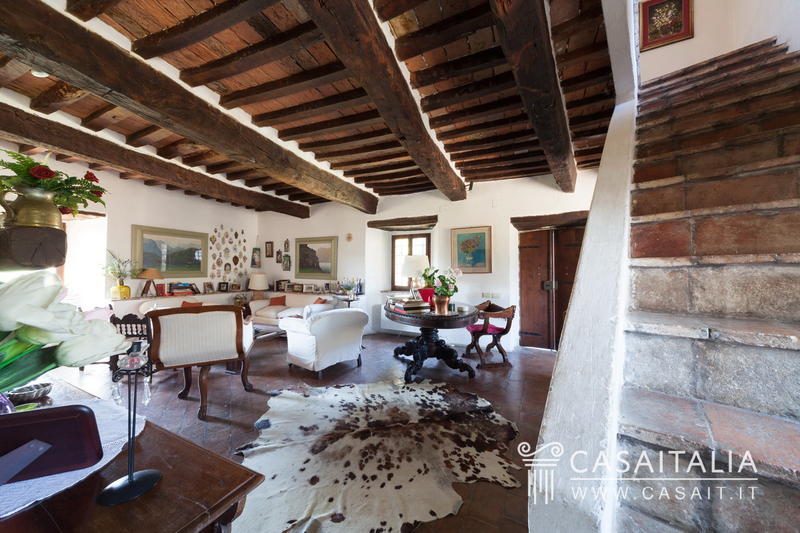 Small hamlet with 4 farmhouses and annexes, surrounded by 50 hectares of land. Mostly restored, it has a habitable surface area of around 1,710 sq.m in total and around 170 sq.m of storage annexes. 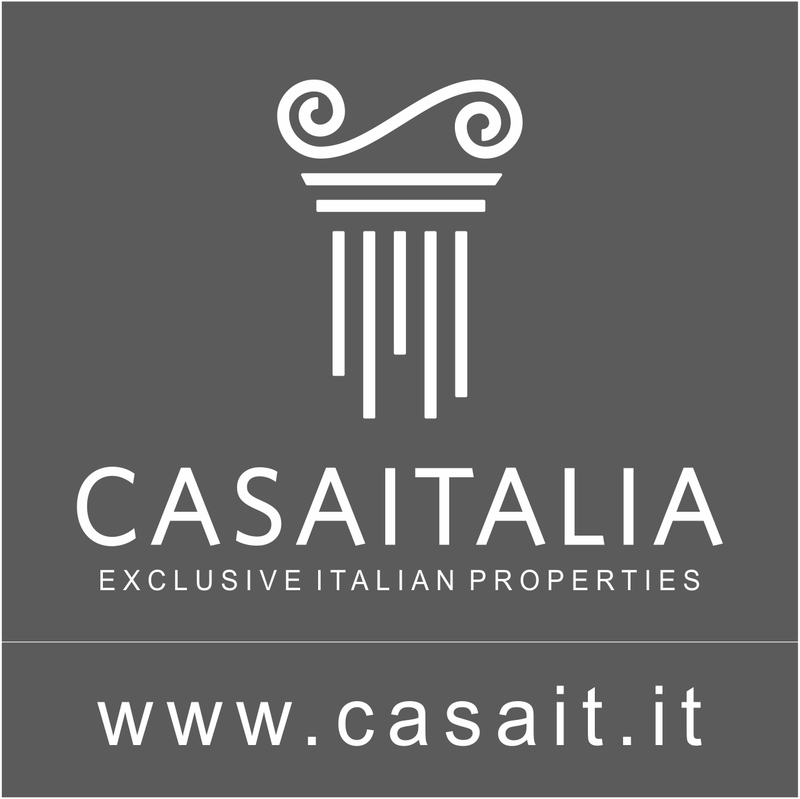 Panoramic and hilly location just 12 km from Todi. 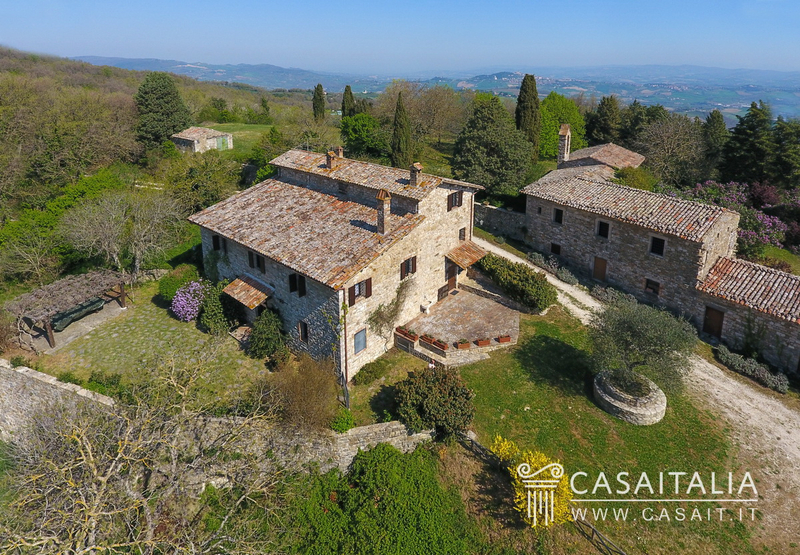 Geographic position Among the hills of Todi, just 12 km from its historic centre, this historic hamlet has been mostly restored with 4 separate farmhouses, a few annexes and 50 hectares of land. 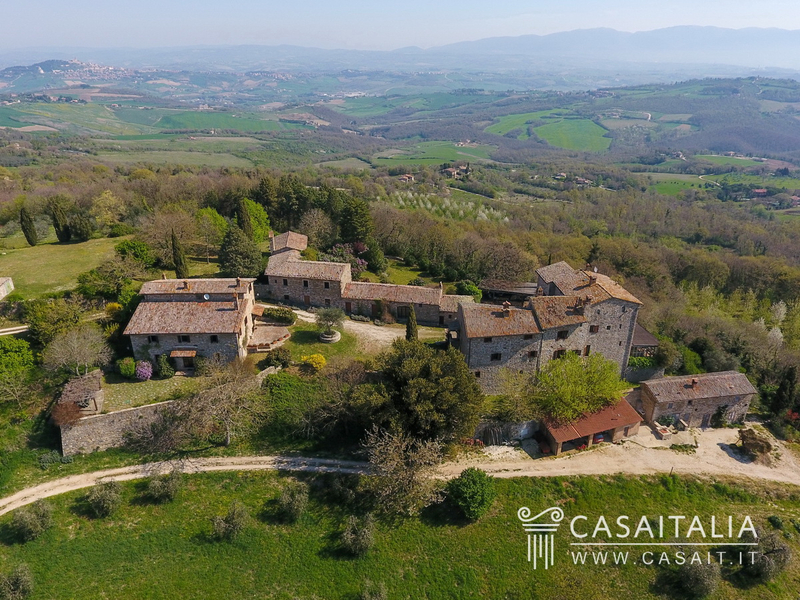 The location is extremely beautiful; hilly and panoramic, overlooking the typical Umbrian countryside, distinguishable by its gently rolling hills, sprinkled with little medieval hamlets. 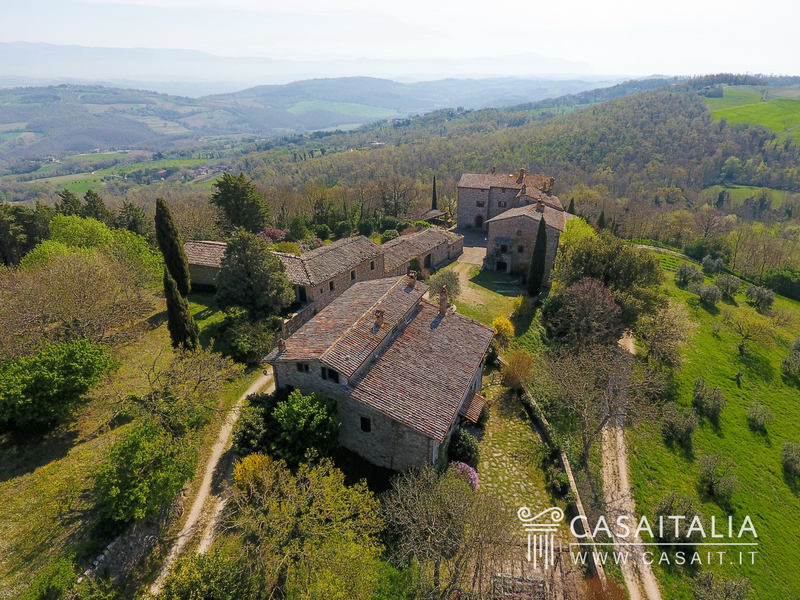 The property is centrally located in relation to Umbria’s main historic centres; in fact, in less than an hour’s drive, it is possible to reach Orvieto (42 km), Foligno (48 km), Spoleto (54 km) and Perugia (58 km),and Assisi (70 km) is a few more minutes away by car. Perugia S.Egidio airport is just 60 km away and can be reached in around three quarters of an hour, while Rome Ciampino (131 km) and Rome Fiumicino (148 km) airports are less than two hours’ drive away. Description of buildings The property extends to around 50 hectares, including a small stone hamlet comprising 4 separate farmhouses, 3 of which have been restored, and a few agricultural annexes. Farmhouse 1 - restored Total surface area: 933 sq.m approx. Farmhouse 1 is split into two separate apartments: Apartment 1 - kitchen on the lower floor, with access to the garden, living room with fireplace, dining room and studio on the ground floor, one bedroom on the first floor and two further bedrooms with two bathrooms on the second floor. On the lower level there are also two cellars and the central heating. Apartment 2 - living room with fireplace, dining room and kitchen on the ground floor, three bedrooms and two bathrooms on the first floor, a large entrance area, large hall, bathroom, storeroom and central heating on the lower floor. 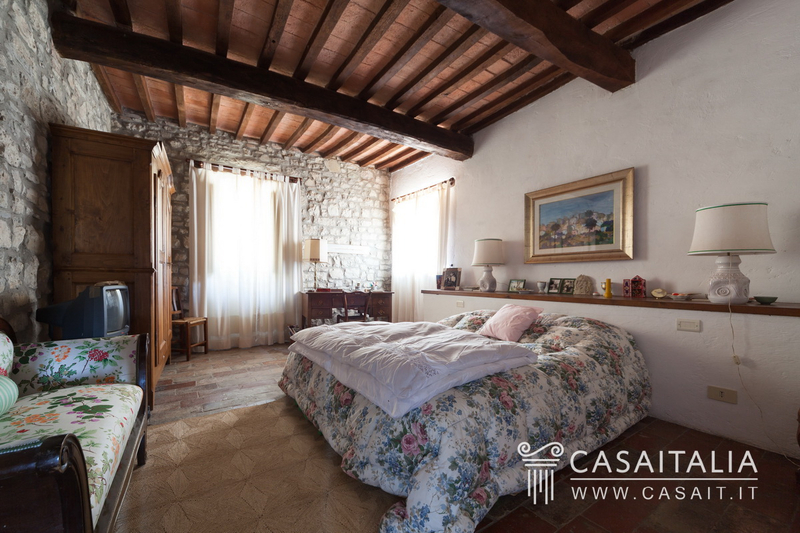 Farmhouse 2 – restored Total surface area: 146 sq.m approx Ground floor with kitchen, living room, storeroom and large cellar, first floor with two bedrooms and bathroom. 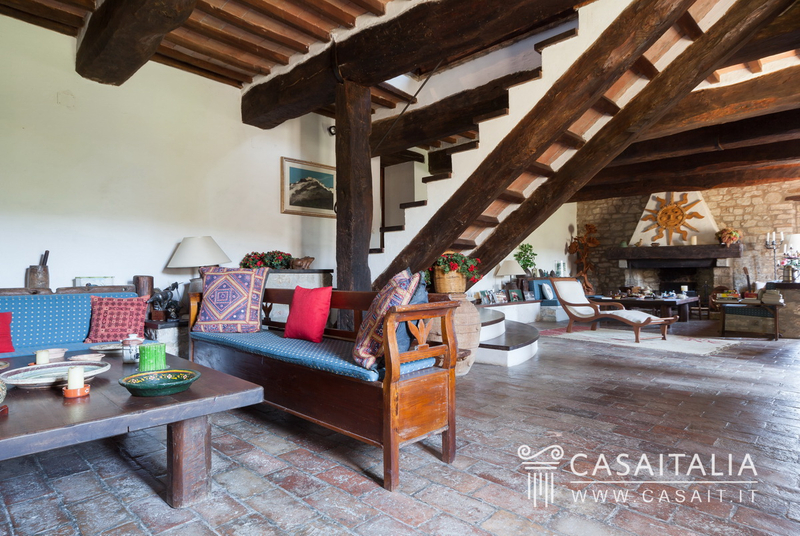 Farmhouse 3 – restored Total surface area:: 461 sq.m approx Farmhouse 3 comprises the living space on the lower floor, with a large living room, kitchen, dining room and cellar. On the ground floor, which also has its own entrance, there are four bedrooms, two bathrooms and a storeroom and on the first floor there is a studio, a bedroom and a bathroom. Farmhouse 4 - to be restored Total surface area: 170 sq.m, plus 248 sq.m of storage space Farmhouse 4 follows the hilly incline of the land and has two floors. On the ground floor there is a living area with kitchen, bedroom, two storage areas/hallways and, with its own entrance, the deconsecrated church, while on the floor below, measuring around 248 sq.m in total, there are some areas used for storage. In addition to the farmhouses there are also 4 annexes: Annex 1: 20 sq.m storeroom and 45 sq.m loft; Annex 2: 27 sq.m storeroom; Annex 3: former stables measuring 50 sq.m; Annex 4: 75 sq.m barn. State and finishing All the buildings are situated within a courtyard, forming a small hamlet where it seems like time has stopped. 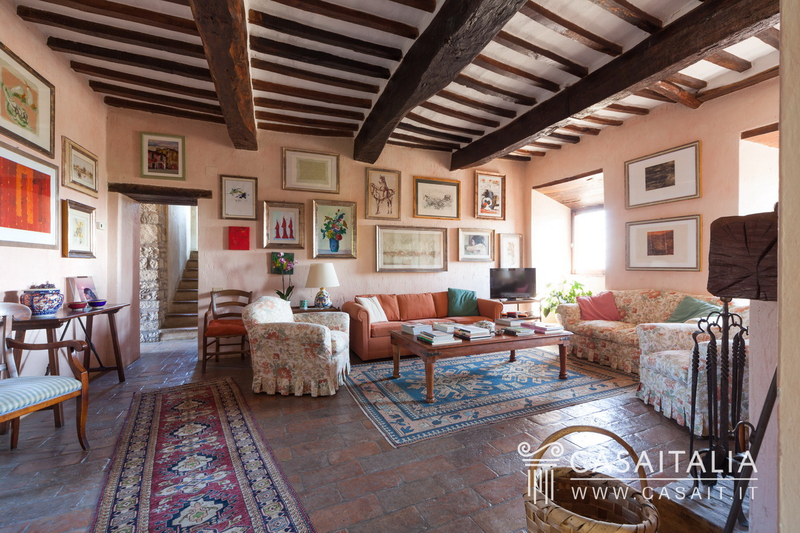 Three of the houses in Borgo Medievale in Umbria have been restored, retaining their original architectural features and finishings. The fourth, which includes the former church, requires restoration. 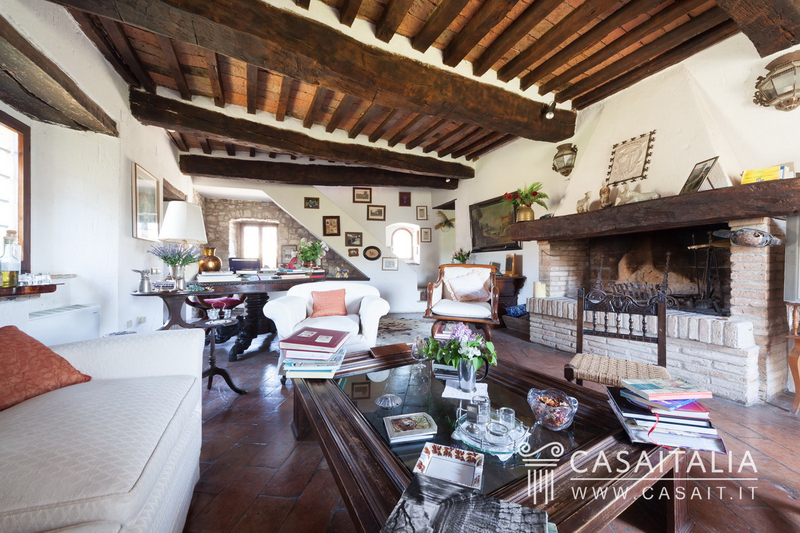 Inside the restored houses there are the original tiled floors, wood beamed and tiled ceilings, some walls with exposed stonework and large fireplaces typical of Umbrian country houses. Outside, the buildings are all in exposed stonework with traditional tiled roofs. External areas Surrounding the houses there are large garden areas to enjoy, with lawn, flowering shrubs and lilac trees, comprising a pleasant internal courtyard, partly paved and partly lawn. On one side of the hamlet there is also a hectare of land used for an olive grove; the property’s remaining land, around 50 hectares, comprises woodlands and fertile fields. 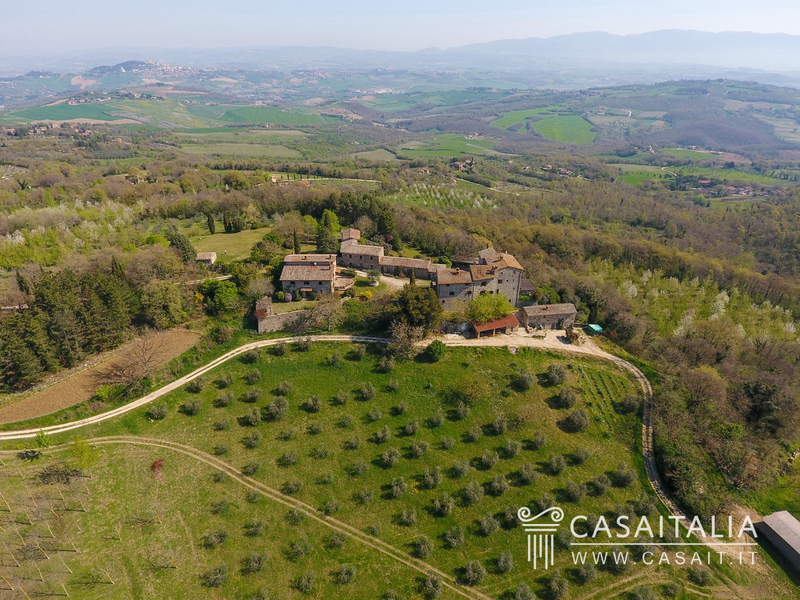 Use and potential uses Borgo Medievale in Umbria is a beautiful property in a panoramic location in one of Umbria’s best-loved areas. 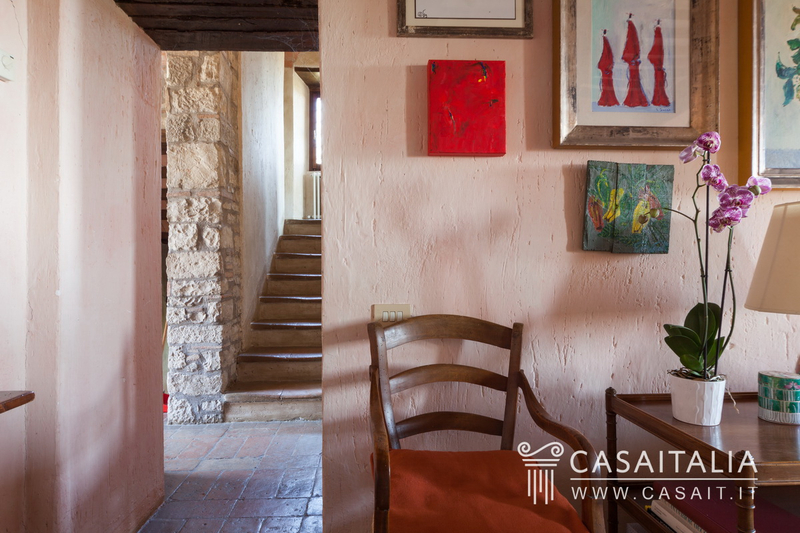 The four houses and annexes make it adaptable for various purposes: as a holiday residence for a group of friends, who want to stay close to each other while still having their own space, or for those looking to set up a tourism business such as a holiday farm or B&B, a few km from Todi, one of Umbria’s most popular historic centres for international tourism.